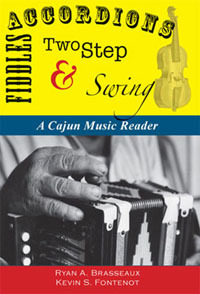 The Center for Louisiana Studies of the University of Louisiana at Lafayette is happy to announce publication of Accordions, Fiddles, Two-Step, & Swing: A Cajun Music Reader, a 535-page compilation of the best material ever written on Cajun music. "They love to dance most of all, more than any other people in the colony," French immigrant C.C. Robin wrote of the Cajun community in 1803. The vibrancy of folk musical traditions in south Louisiana has captured the imaginations of historians, music aficionados, and dancers across the world. Editors Ryan A. Brasseaux and Kevin S. Fontenot provide a sweeping overview of Cajun music, from early studies of the musical genre, to organizations based on preserving culture through music, to its early heyday on the radio and festival stage, to its present state, edging onto the national radar with Grammy awards, blockbuster movie soundtracks, and revolutionary adaptations of old Cajun standards. The materials featured in this volume are organized into categories based on their thematic focus�socio-cultural context, commercialization, and artist biography. Accordions, Fiddles, Two Step & Swing is designed with scholars, students, and Cajun music aficionados in mind. The articles included represent the spectrum of Cajun musical expression as interpreted by authors from all walks of life. Materials ranging from instrumentation to information dealing with specific artists and social contexts demonstrate that Cajun music is defined more by ethos and social context than a delimited set of stylistic features. We hope this collection of essays will stimulate a new generation of researchers to document shifts within the local, regional, even global soundscapes. Perhaps this collection of essays will also encourage budding scholars and established humanists alike to document a bit of culture for posterity one song at a time. Copies can also be ordered by visiting http://booksxyz.com/profile3118850.php for the paperback or http://booksxyz.com/profile.php?id=3118851 for the hardcover.